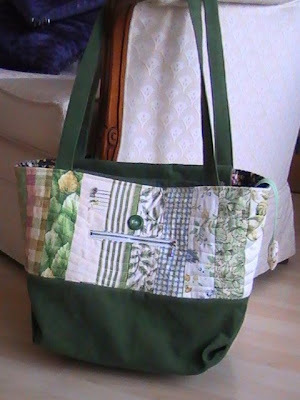 stitched and quilted them together to make the tote bag . 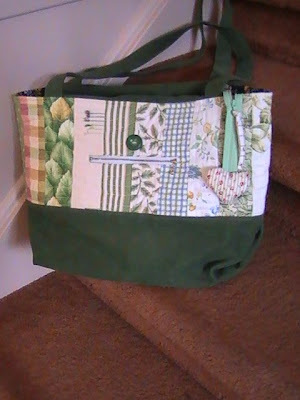 Yes, this is the tote I posted about previously. 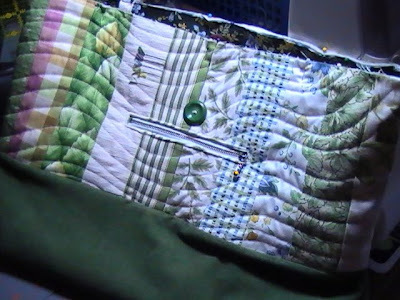 I removed the super stiff fusible interfacing and decided to use quilt batting for the pieced upper part of the tote. 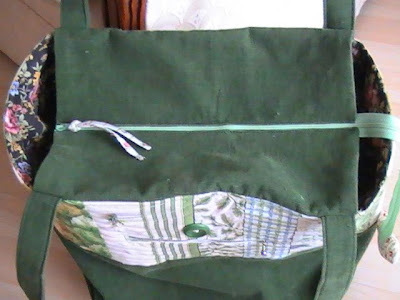 I only used the super stiff interfacing as an insert in the very bottom of the tote, to give it some shape. A D-ring is attached to the tote inside for me to clip my keys to. 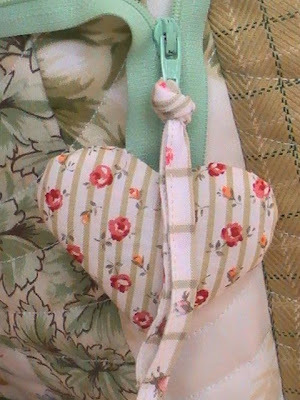 A heart shaped zipper stop was a fun detail for the top of the tote. Corduroy acquired from a thrift store visit, makes up the bottom, the handles and the zipper boxing along the top. 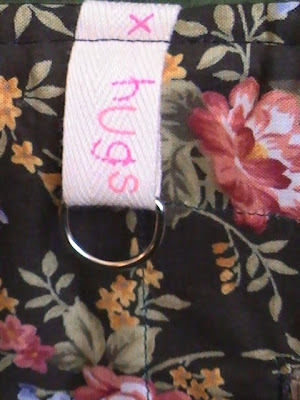 Three zippers, also thrifted finds, were used. 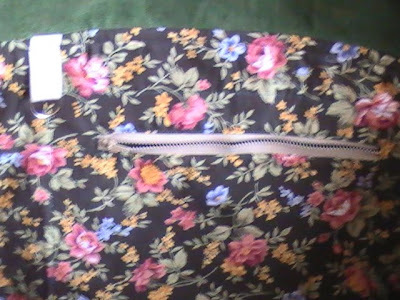 The blurry shot below shows the zippered pocket in the lining (also made from thrifted fabric). 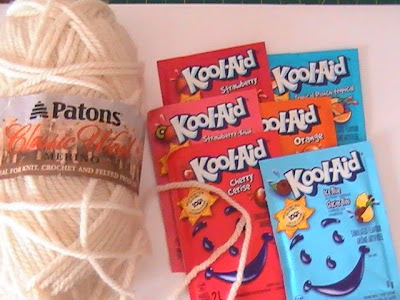 This is my yarn after being dyed with different packages of Kool-Aid. 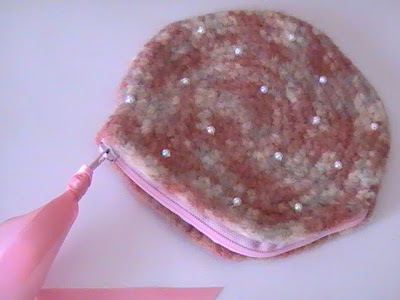 The newly dyed yarn is basically a warm rose colour, with some pale bits and some patches of grey/green in it. 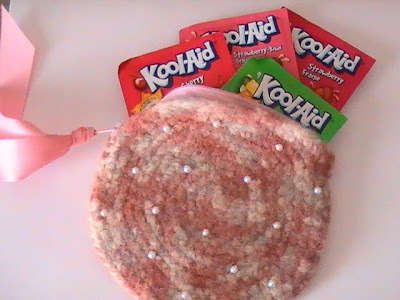 For a first time dye project, the Kool-Aid was easy to work with (bonus was the yummy scent from the different flavours). Next time I won't combine so many colours so close together on the yarn as I believe that's why my colours aren't more vivid. It surprised me that the felting process didn't alter the colours of my project. 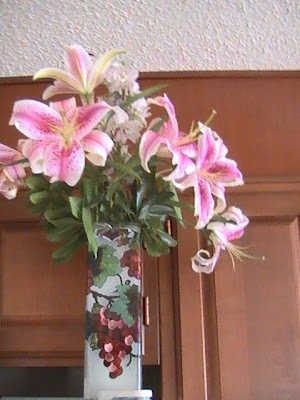 I was a little concerned that it would - which is why I started with such a small item. 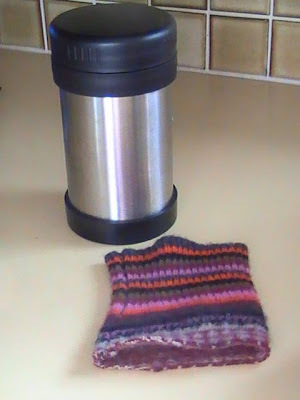 I can see how dyeing yarn could become addictive and I would love to experiment some more. 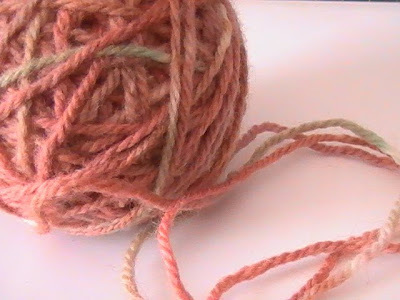 Have you tried dyeing yarn? I'm back to work and in cold weather, I like bringing homemade soup for my lunch. My problem is that by lunchtime the soup in my thermos isn't hot. I crafted a solution. 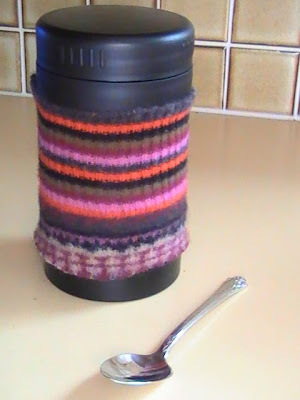 I used a ribbed cuff from a felted wool sweater to make a "snug" for my soup thermos. Here's a project finish that has been lingering for far, far too long. 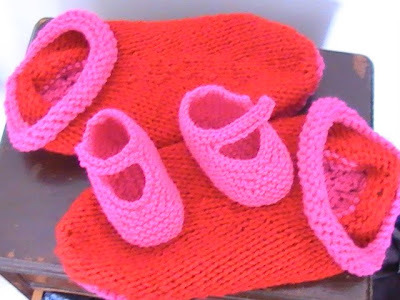 I knit these slippers for myself months ago but didn't felt them until now. 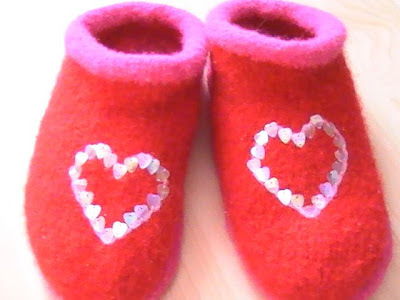 I had fun adding some heart shaped sequins after felting (I needle felted the hearts on before stitching on the sequins). 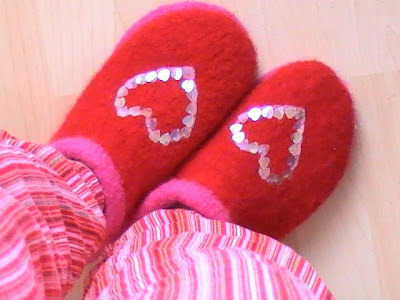 My 'Love Me' slippers are toasty warm, comfy and my new favourites. and spending most of my days in bed trying to get better. 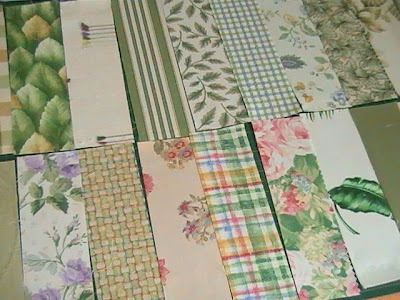 I've been knocked flat with a nasty bug, but as soon as I'm back on my feet again I have some projects to finish off and share.